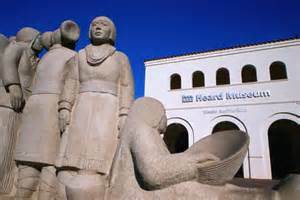 I am pleased to announce that Sinclair Travel Center of Mesa, Arizona has accepted ten of my tours to Indian Country for their winter and spring group touring schedule. They are providing all sales. Call Louise at 480-981-3795 to make reservations soon. 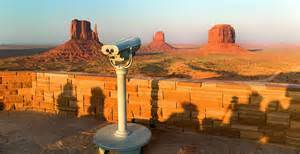 Call or visit Sinclair Travel Center – 6134 E. Main St, #106 Mesa, AZ – to book your tour(s) soon. 480-981-3795 You can request more detailed information about each tour of interest. Flyers are available. Have you ever wanted to spend an afternoon strolling the charming streets of Santa Fe, stopping at select restaurants, meeting each chef, and tasting something specially prepared just for you? You can have it, thanks to the world famous Santa Fe School of Cooking during an upcoming tour provided by Affinity Group Tours. 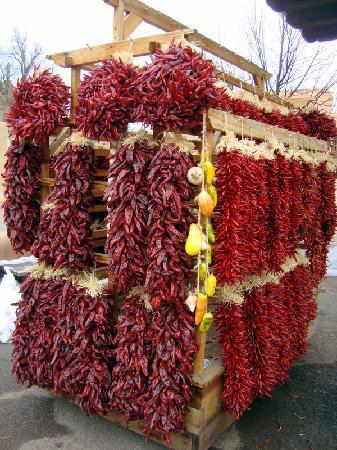 On May 31, 2014, the Santa Fe Art and Culinary Tour begins a five day/four night tour starting at the Albuquerque, New Mexico airport. 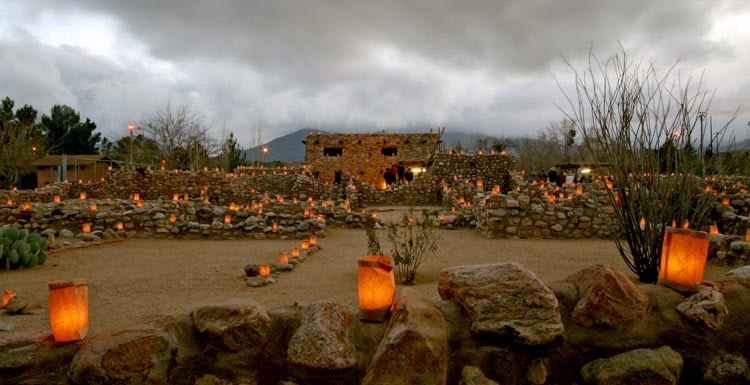 As your private tour guide, I will whisk you off to Santa Fe where you will stay at the enchanting Hotel Santa Fe, owned and operated by the Picuris Pueblo. The hotel has the highly rated Amaya Restaurant which mixes classic technique, contemporary flair, and fresh seasonal ingredients from the cold rivers of Alaska to the Great Plains. 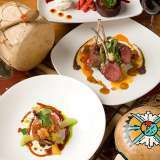 Chefs Patrick Kline and Walter Dominguez select superb ingredients and weave them together in a style highlighting local pueblo and Northern New Mexican influences. And, Amaya is just the start! 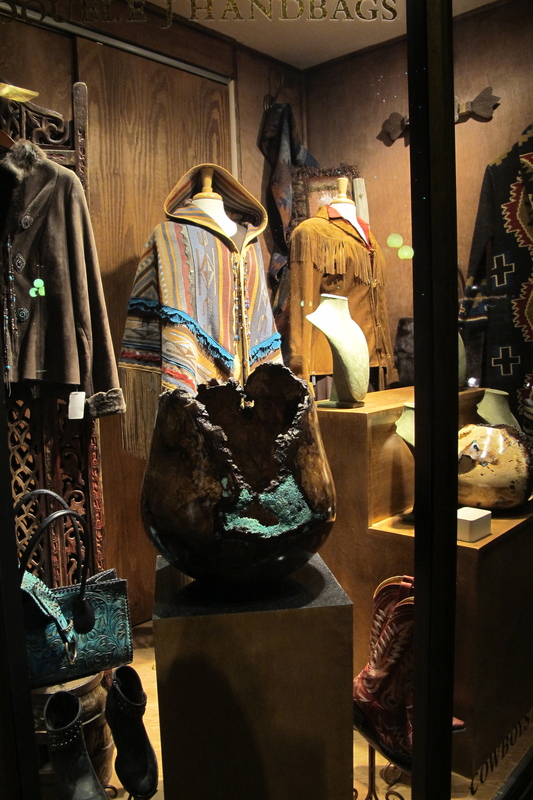 Each day, you can enjoy New Mexico cuisine intermixed with visits to the best art galleries of Canyon Road & the Downtown Historic Plaza, tour multiple art and historical museums, enjoy winding walking tours, and shop Santa Fe style. It’s a fun filled tour designed for those who love food and art! Visit www.affinitygrouptours.com for more information and reserve your space today. 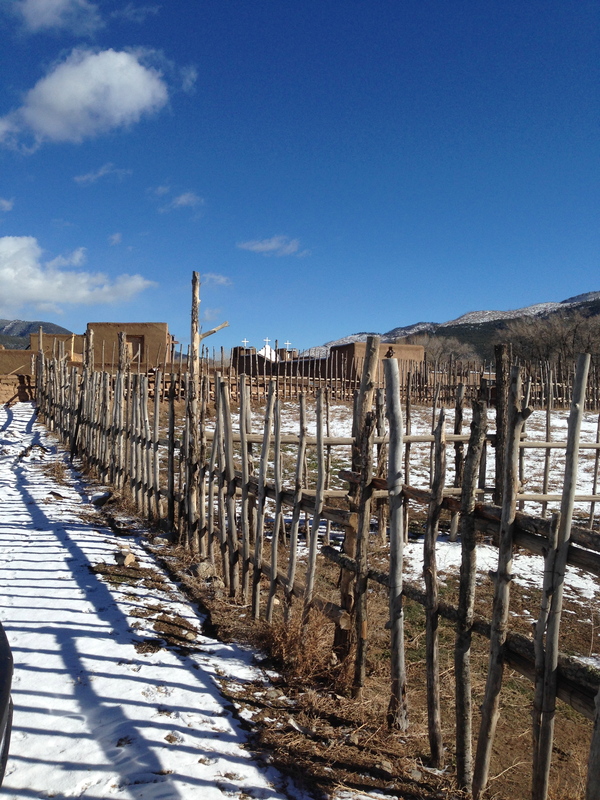 Visiting Taos Pueblo in New Mexico? In 1960, Taos Pueblo was designated a National Historic Landmark; it was added to the National Register of Historic Places in 1966. In 1992, the Pueblo was admitted by the United Nations to the “World Heritage List,” due to its uniqueness and universal value to the heritage of all mankind. 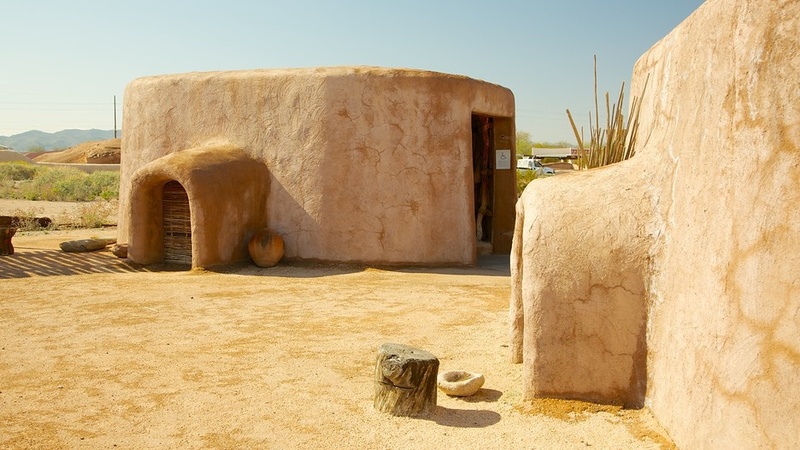 When you visit Taos Pueblo, you will have an opportunity to learn about their history and culture, as well as to purchase fine arts and crafts. If you are fortunate to visit on a feast day, you will experience songs and dances that have transcended time and are passed down from generation to generation. Dances are held throughout the year, and most are open to the public. Information above from this link: http://www.indianpueblo.org/19pueblos/taos.html Visit Taos Pueblo soon. The drive to Whiteriver, AZ from downtown Phoenix takes about 3 hours. 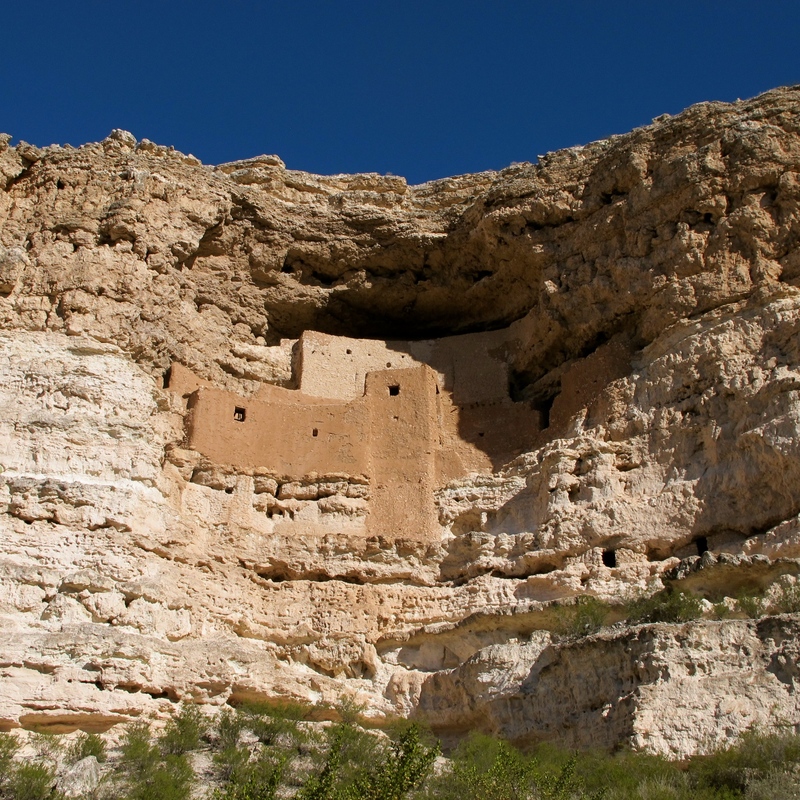 On the way, you pass the mysterious Superstition Mountains, the mining towns of Apache Junction, Superior, Miami, and Globe, then head north through the San Carlos Apache Indian Reservation, down to the bottom of the Salt River Canyon, and up to the White Mountain Apache Reservation. It’s some trip! Upon arrival, we were greeted by Ramon Riley, the Cultural Resource Director. 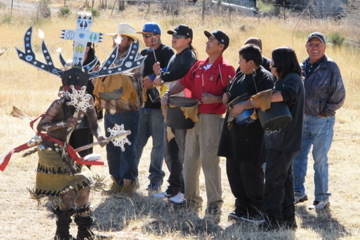 He shared Apache history and how the tribe continues today. He then honored us by allowing our group to experience a few young student Crown Dancers, dancing and drumming under the oversight of a young Medicine Man, their mentor. These young teens may some day be future healers within their community. Following a picnic lunch, we toured the wonderful White Mountain Apache Cultural Center which shares their culture with beautiful visual displays. Several artisans brought lovely pieces to sell and educate. 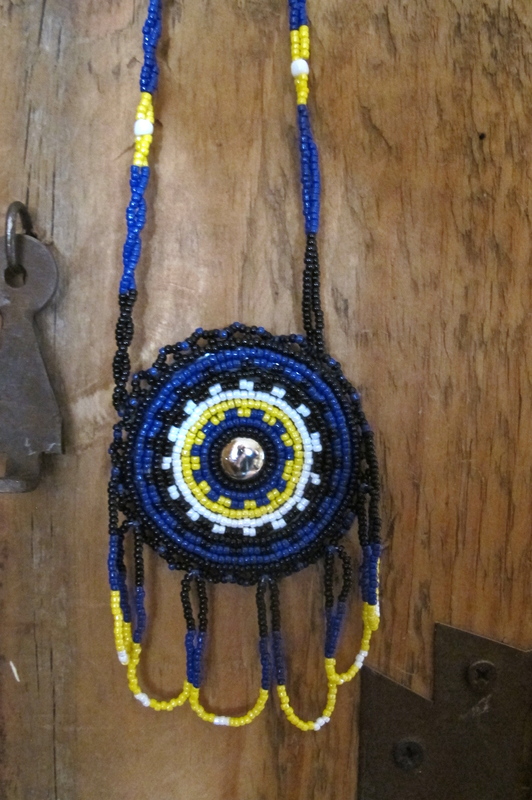 I, of course, had to buy a beaded necklace from a young Apache woman named Jan Johle. 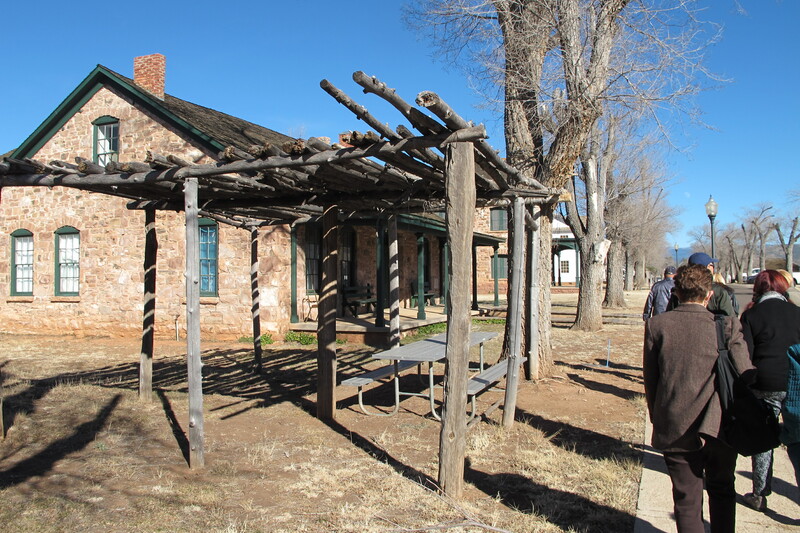 Our group enjoyed a slow-paced guided walk by our host, through the grounds and historic buildings of Fort Apache including the Indian Boarding School, still in operation (since 1923). The Army post itself operated from 1870-1922. 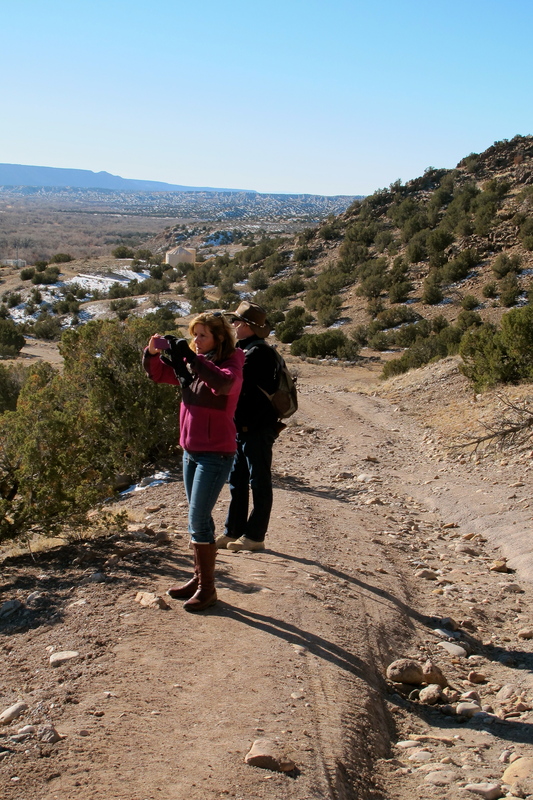 Winter is a beautiful time of the year to tour ancient Puebloan ruins in New Mexico. The Posi-Ouinge Ruins near Ojo Caliente are no exception. 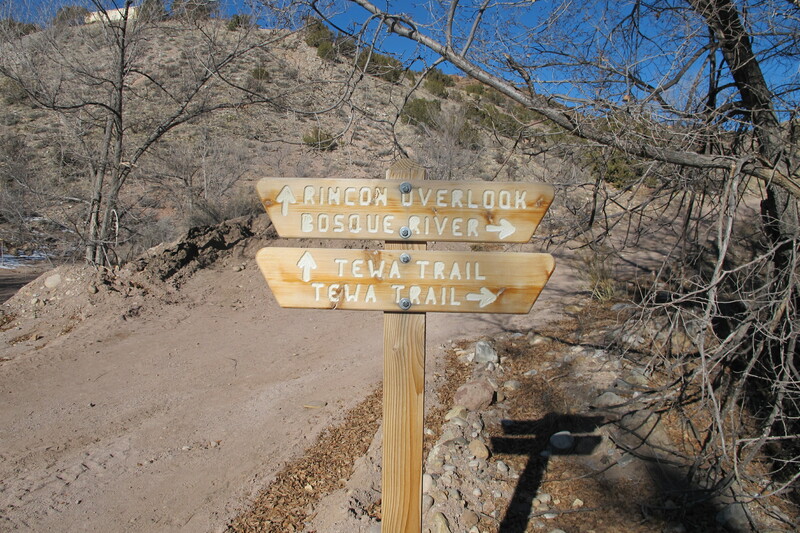 The trailhead begins right behind the main entrance to the Ojo Caliente Hot Springs Resort & Spa. The trail to Posi is steep and rocky in places, sandy, and level in others. The round trip hike covers about a mile. Visitors should wear comfortable hiking shoes, carry water, and plan on an hour’s walk. 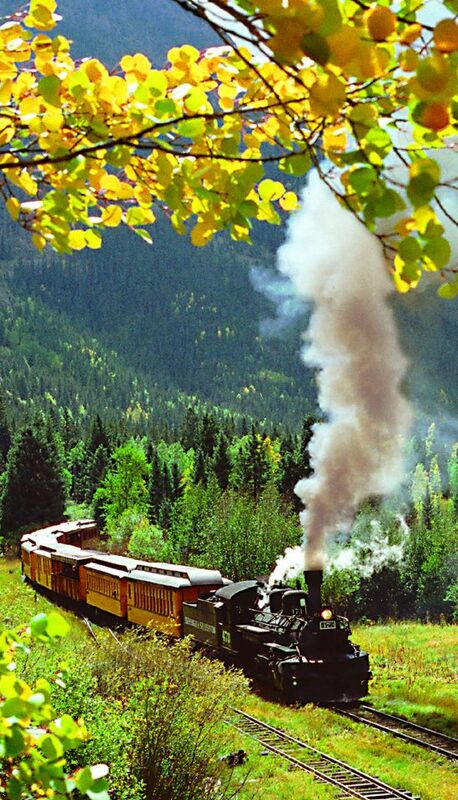 Climb up about a half mile to breathtaking views that the original inhabitants enjoyed. 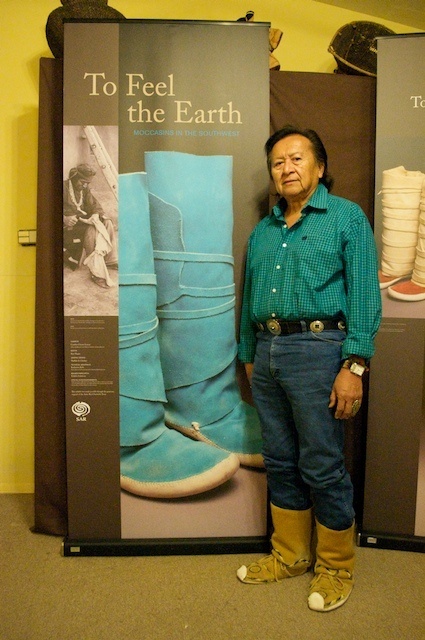 Posi-Ouinge or Posi, the “Greenness Pueblo”, is a special place for many Tewa Indians. The early Tewa lived in the Ojo Caliente drainage during the late 1300s until the early 1500s, just before the Spanish entered the area. 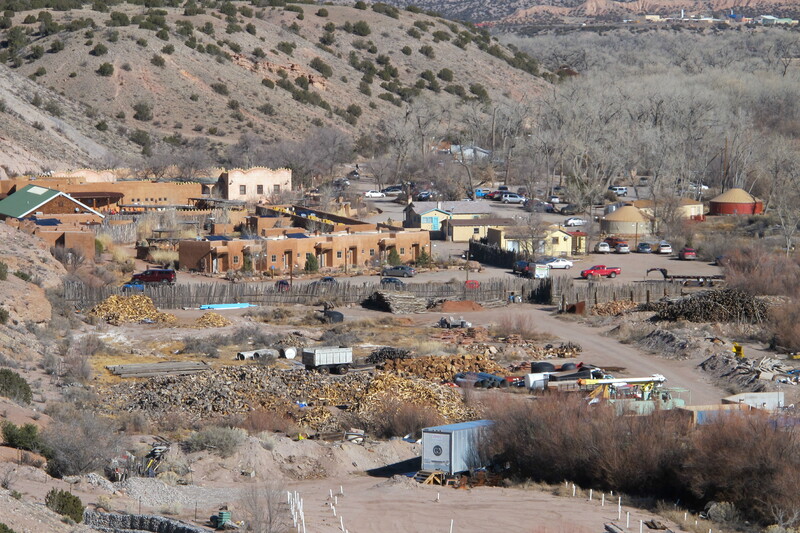 Throughout history, Ojo Caliente has always been a special place. Continue your walk up the trail and imagine life here half a millennium years ago. 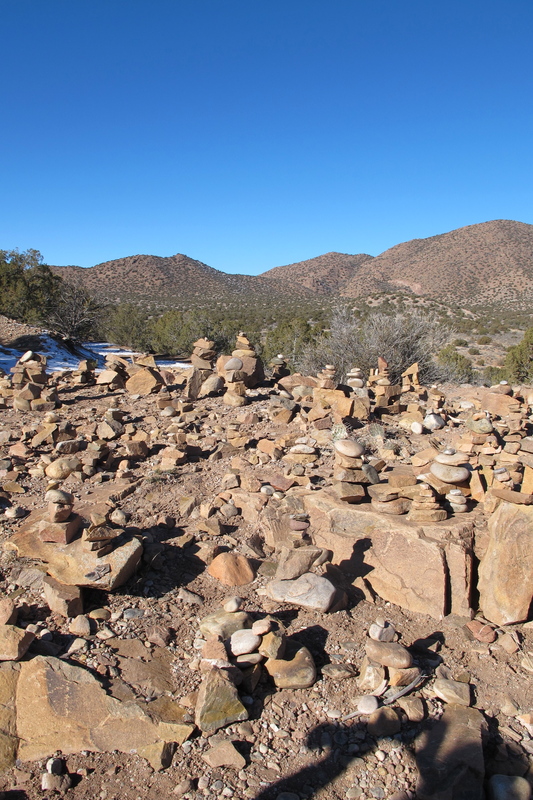 A surprise at the top of your first climb is a large grouping of stone caryns. It obviously is a popular resting point giving you time to add your own caryn. Posi was a vibrant center of activity in the 15th century. The village may have had as many as 1,000 ground floor rooms and almost as many on the second and third levels. There were doorways and roof entryways accessing each floor. Fire pits in the clay floors kept the small rooms warm. 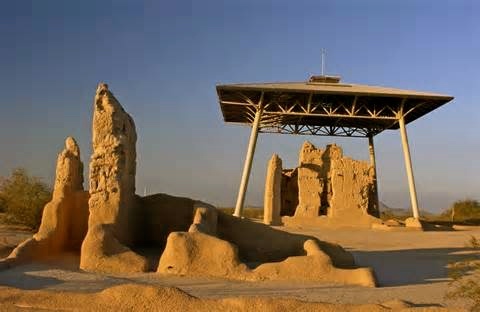 Adobe was an efficient building material, retaining warmth in the winter, and maintaining cool temperatures in the summer. 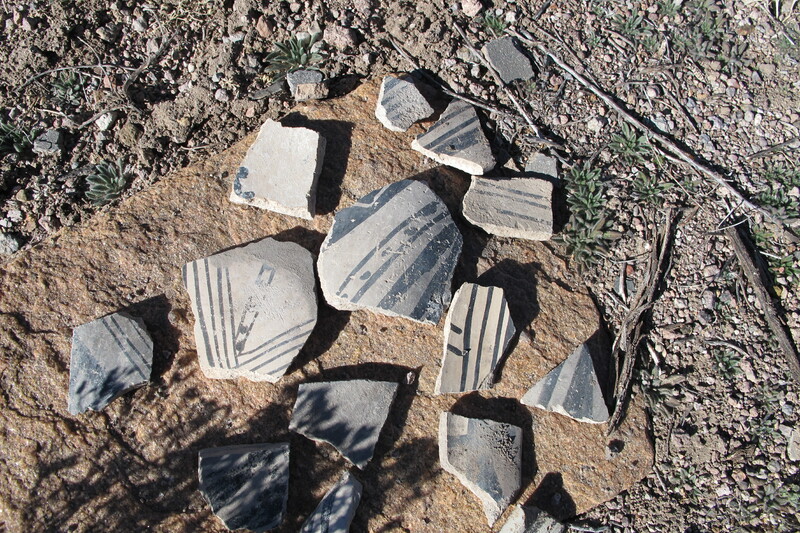 Today, little remains; but Tewa pottery shards are everywhere! 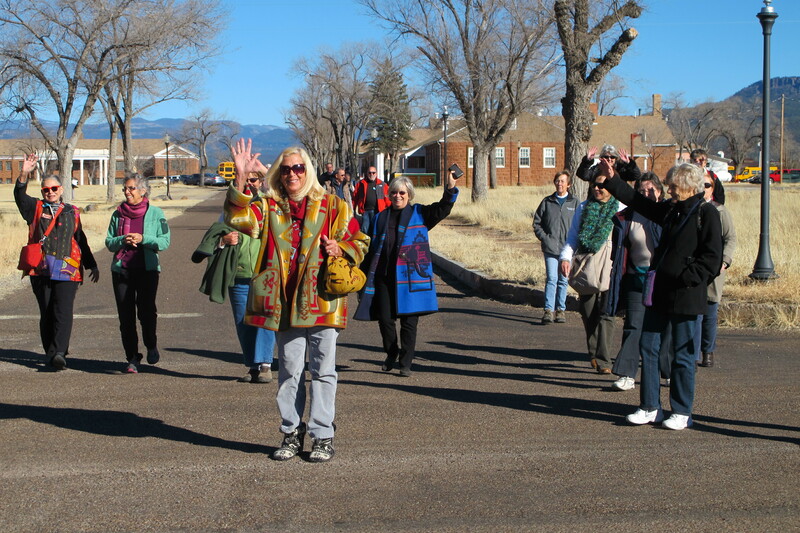 Posi is a special place to those who live in northern New Mexico. Out of respect for the Pueblo descendents, please look closely, take photographs, but leave them as they are. This is their history. 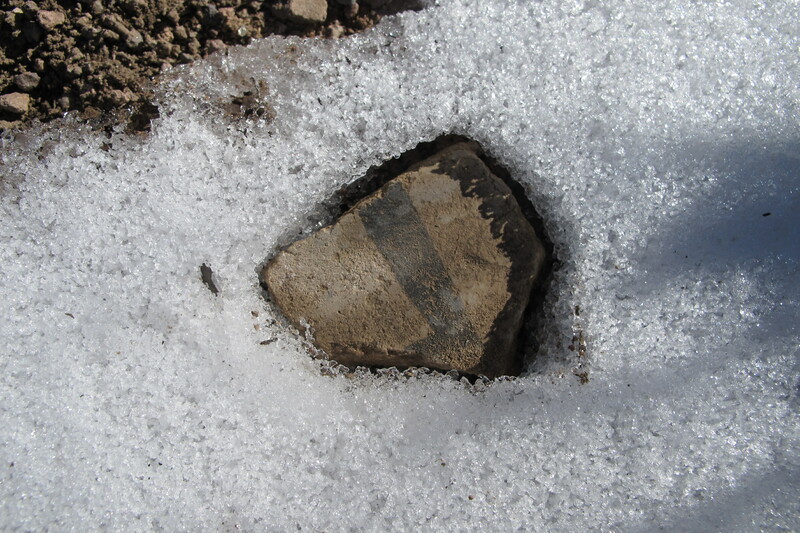 Surviving all kinds of weather, the Tewa leave permanent gifts to mankind. Finally, the descent down gives you views of Ojo Caliente Hot Springs Resort, a great place to stay and soak your body after your climb to Posi-Ouinge Ruins. 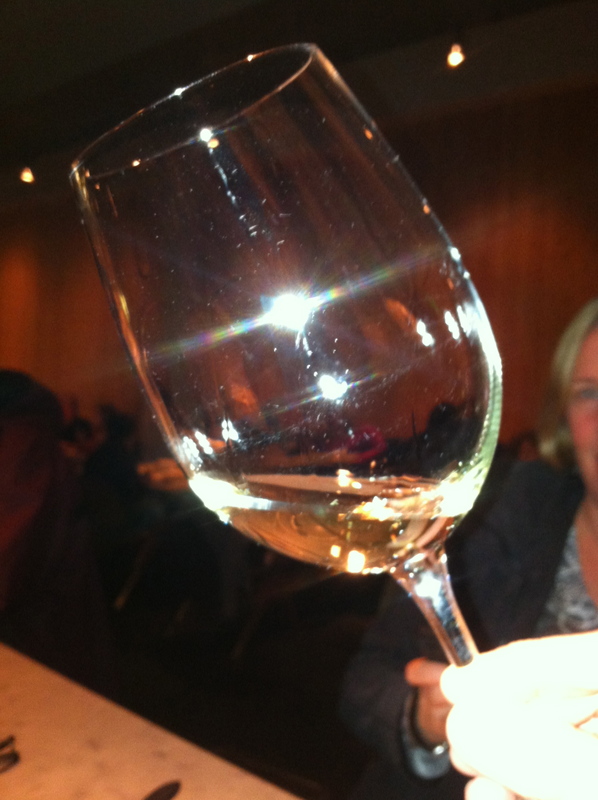 This tour is for those who love art, cuisine, beauty, & history! Enjoy an exciting group tour description. Hear of the many exquisite art galleries, museums, the cooking school, the Historic Downtown walking tours, and the luxury accommodations. Meet the Artist Tour Guide, and learn how the Arizona Consortium for the Arts will benefit. Come join us and register early. Space is limited so RSVP now. Mark your calendars for January 17th!